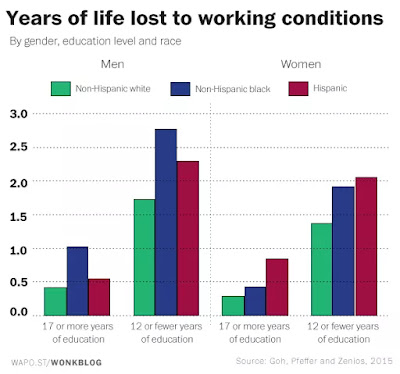 Your job is literally killing you (WaPo). This piece is well worth the 3 minutes it takes to read it in its entirety. 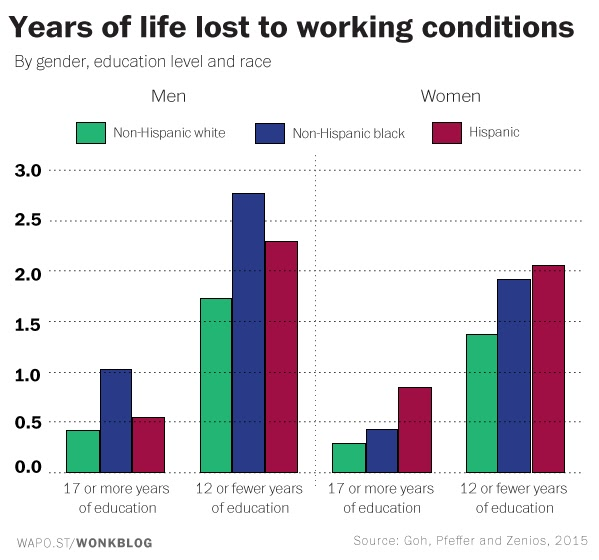 Bottom line: Your work life affects your life expectancy. Pew Research found "Across all groups, unemployment and layoffs, and a lack of health insurance, were the factors that exerted the biggest influence. 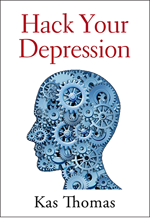 Low job control was the next biggest influence for both men and women, followed by job insecurity in men and shift work in women." Virginia ended veteran homelessness. Why not just end homelessness? (americablog.com) We have the means, and the moral obligation, to feed and house all people. Why are we not doing it? Why is this not a priority? Auto Insurance Rates Are 70% Higher If You Live in a Black Neighborhood (time.com). "State Farm, Allstate, and Geico all exhibit a disparity of at least 52%; Progressive and Farmer’s Insurance are the worst offenders, averaging a 92% disparity between insurance premiums paid by customers living in mostly-black and mostly-white neighborhoods with good driving records." Democratic Socialism in the United States (berniesanders.com) by Bernie Sanders. Lots of foreign policy discussion here, as well as political economics. Read this and understand it before you glibly accuse Sanders of this or that. Cops Claim LSD Killed This Dad, but Autopsy and Video Confirms They Hogtied Him to Death (alternet.org). E. coli Isn't Chipotle's Only Problem (bloomberg.com). 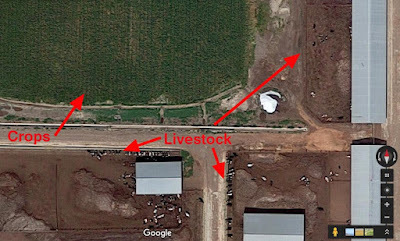 Meanwhile, the Costco E. coli problem has been traced (apparently) to produce from a farm in Tracy, California, situated in close proximity to cattle (see Google Earth photo below). After raising record $3.4M on Kickstarter, UK mini-drone startup collapses (arstechnica.com). Tiny drones. Big oops. Do Charter Schools Cherrypick Students? (mathbabe.org) Mathbabe strikes again. Damn, she's good! Quantum entanglement achieved at room temperature in semiconductor wafers (phys.org). Goldman eyes $20 oil as glut overwhelms storage sites (telegraph.co.uk). "Goldman Sachs told clients that the increasing glut of oil on the global market has combined with mild weather from a freak El Nino this winter. The twin-effect could send prices plummeting to $20 a barrel, the so-called ‘cash cost’ that forces drillers to abandon production. ‘Risks of a sharp leg lower remain elevated,’ it said." Overdrilling meets slumping demand meets cash-flow addiction, in an ever-worsening runaway-deflation cycle. Golden Sacks has this one right, I think. Facebook Eclipses Google for News Referrals (fortune.com). How Many Words Are There? (oxfordhandbooks.com). Your question is ill-posed. Try again. How Many Nuclear Warheads Does Israel Have? (isis-online.org). Probably about 115. AMA Calls for Drug Advertising Ban in Position Reversal (bloomberg.com). The U.S. is one of few countries that allows direct-to-consumer drug ads. The American Medical Association now says it disapproves of the practice, because it pushes up drug prices. Current Copper Price Below Cost of Production (econmatters.com). But they'll make it up on volume! Enjoy today's roundup? Share the link! And check out last week's edition, or the week before that.